Wolfgang Polishing Pad Rejuvenator is a concentrated pad cleanser that cleans and restores foam and wool buffing pads. In 15 minutes, your soiled buffing pads are clean and ready to use again. The citrus formula eliminates oily compounds and polishes trapped within the pads, and it rinses clean. 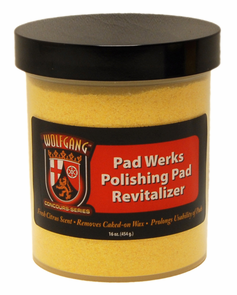 Wolfgang Polishing Pad Rejuvenator can extend the life of your pads! Wool pads can become caked and matted with polish. Foam pads become stiff and hard. Wolfgang Polishing Pad Rejuvenator soaks into the fibers of wool and the pores of foam to release caked on car care products. Once the foam�s pores are unlocked, foam pads feel suppler and are better able to conform to the curves of your vehicle. Wool pads regain their polishing ability. Wolfgang Polishing Pad Rejuvenator can save pads that you might otherwise throw away. Saving pads saves you money. It just makes cents. Wolfgang Polishing Pad Rejuvenator is a citrus concentrate that dissolves in water to create a powerful cleanser. This is not a soap! Soap leaves a residue. Wolfgang Polishing Pad Rejuvenator rinses completely clean. Its safe on foam and wool, and it doesn�t alter the texture of the pads. Your buffing pads will be as good as new! This remarkable product comes packaged in a re-sealable plastic bag. Whatever your pad cleaning regimen may be, this 8 oz. bag will last and last. Just one scoop of Wolfgang Polishing Pad Rejuvenator makes 3-4 gallons of fast-acting pad cleaner. The best part is, you can drop the soiled pads in a mixture of Wolfgang Polishing Pad Rejuvenator and water, and leave them. The cleanser instantly starts breaking up oily deposits within the foam and wool without requiring you to scrub. Let the pads soak for up to 15 minutes and rinse. For heavily soiled pads or dry pads, you may need to agitate with a Foam Pad Reconditioning Brush. Wolfgang Polishing Pad Rejuvenator cleans your pads as good as new. Tip: Before you begin detailing your vehicle, mix up a batch of Wolfgang Polishing Pad Rejuvenator. As you use pads, toss them directly into the bucket of pad cleaner. The polish won�t have a chance to dry on the pad. Cleaning up will be much easier! Every package of Wolfgang Polishing Pad Rejuvenator comes with a FREE 1 ounce measuring scoop. 1oz. in a bucket of water and soak your pads as you use them, keeps them from getting dry, till you can thoroughly clean them. In conjunction with the pad spray cleaner I can remove any product, and reuse all pads. I'm a beginner and did not know this process with my first batch of pads, kept them dirty in a plastic bag for 2 months, had a terrarium growin' . Needless to say bought all new pads and will keep them nice with the help of WPPR. ProsDraws the used product out of pads, doesn't hurt backing. Worked like a charm, I was using XMT polishing pad cleaner prior. XMT worked good- but this stuff is noticeably better, I get a more thorough clean vs constantly spritzing my pads. I really like being able to through my pad in a bucket to soak as I through on a new one to keep working. Also has a nice pleasant scent. Rinses very clean.